Despite a double championship defeat to Red Bull and Sebastian Vettel in 2010, Lewis Hamilton insists he is not tempted to switch teams any time soon. "There is not one bit of me that feels I will ever want to drive for Red Bull," he told the Mirror in Abu Dhabi. "It doesn't have the character, the history or the appeal to me that McLaren has." Hamilton finished fourth in the 2010 standings, behind both Red Bulls and also his former McLaren team-mate Fernando Alonso, who now drives for Ferrari. But he said McLaren is his team of choice. "My hero Ayrton Senna drove for this team and I have always wanted to," he said. 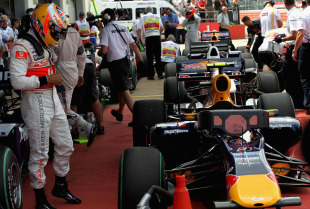 "Red Bull have done a fantastic job and huge congratulations to them for winning the constructors' championship. Of course, I want my car to be as good as that. I could be here for the next 10 years in this team. I believe they have got the most potential out of everyone."